We booked a tour with See Sri Lanka tours and Chaminda was our driver for 9 days (29.01. – 06.02.2019). Our tour started in Kalpitiya and from the first meeting, Chaminda was always really friendly and forecoming. He picked us up in his new, extremely clean and well-maintained minivan and our journey in Sri Lanka began. Our route was Kalpitiya – Anuradhapura – Dambulla – Sigiriya – Kandy – Nuwara Eliya – Ella – Yala -Tangalle. 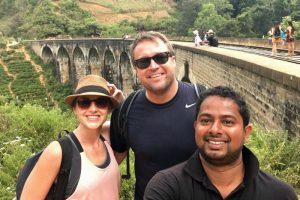 When getting in contact with Chaminda, we had a rough idea of the route we wanted to travel. With his help, the route was made perfect. Along the way he showed us many things which are special for Sri Lanka and explained us all the details which are important to know about this beautiful country. We stopped often for fruit stands, where he explained us where the fruit/food comes from, how it is made and what benefits it has. During our trip we made two safaris, visited multiple temples and went on numerous hikes. All of those were organized with the help of Chaminda and his many contacts in the different areas. Always making sure, we got the best service and price one can get. Any question we could possibly think of about Sri Lanka, the people, the culture, the religion and the food here, he knew it all. During our stop in Kandy, he even invited us to his family home, where we learned the proper way of old school Sri Lankan cooking. We cannot recommend Chaminda highly enough as a driver, guide and as a friend and really loved to have him around for our trip. Always on time, with a smile on his face and with fresh flowers on the dashboard he was driving us safely through the, sometimes crazy, traffic in Sri Lanka. We thank you a lot Chaminda for showing us your beautiful country and its many different faces, which we really fell in love with.